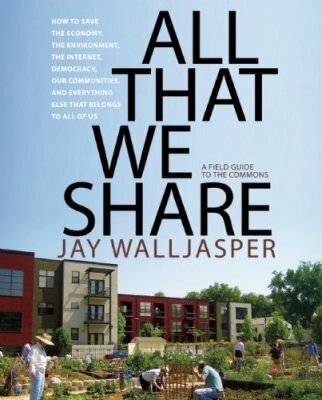 Today’s list offers recommended reading on the topics of sustainability and community. Those terms mean different things for different people, so let’s just call this my personal list. I’ve either read these or had them recommended by people I know share the same aspirations in these fields as I do. Collectively, they provide a pretty good template for making a start on building a community that’s less wasteful and more attuned to community building and responsibility to our descendants. I do not rank them in any order and I’m sure to have left some great books out because I’ve limited it to books I have on the shelves this very minute. For example, if on Saturday I sold my last copy of Animal, Vegetable, Miracle: A Year of Food Life by Barbara Kingsolver, et al., and it won’t be back in stock until Tuesday, then it won’t be on this list. Beginner’s Guide to Community-Based Arts: Ten Graphic Stories About Artists, Educators & Activists Across the U.S.
All of these books are in stock and can be researched further at our online store here. In honor of all the great news this week about the move toward a more sustainable future, these titles will be on sale for the remainder of February at a 20 percent discount from the list price, while supplies last. Think of it as your reward for reading these weekend blog postings. And if you know my wife, Ann, join me in wishing her a happy 50th birthday (no, she doesn’t look it, does she?) on Tuesday. Were it not for her, there would not be a Destinations Booksellers.